Prior to the Second World War the Indian Army encouraged shikar (hunting) as a way to develop stalking and shooting skills, although this activity was controlled by game laws. When Pandit Jawaharlal Nehru became Prime Minister, his love for wildlife and nature caused the brakes to be applied, gently, to illegal hunting and cutting of trees. The Indian Wildlife Act was passed in 1972 and brakes applied strenuously. It was during this period that the military became increasingly conscious of their role in wildlife protection. All Cantonments became environmental friendly – banning use of plastic bags, tree plantation drive, water conservation, rain harvesting, etc. There are many instances of Indian Army men saving wild life. Raising the bar on dedication towards the nation, the Indian Army personnel of Tenga Garrison in Arunachal Pradesh ‘literally’ went out of their way and rescued a bear cub from the clutches of poachers. A group of elephants were crossing the area when the young elephant fell into the water tank and got stuck near Silliguri in West Bengal. 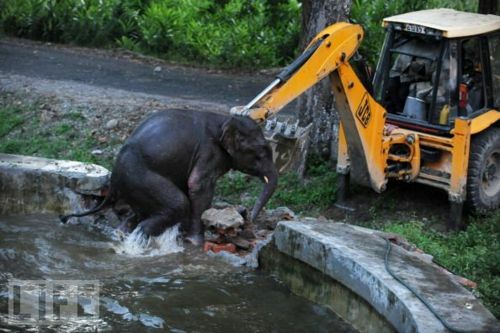 Soldiers rescued the elephant using a bulldozer. The three-year-old elephant was only able to clamber out of the sunken pit when the dozer destroyed some of the tank’s surrounding wall. During our Sikkim Tenure, we were located at about 10,000 feet above sea level near an Alpine Sanctuary. The region holds some of the most beautiful oak, rhododendron, and coniferous forests and alpine meadows. Leopard cats, black bears, and the endangered musk deer are found here, in addition to many rare high-altitude birds. In this area we wore our woolen clothes throughout the year as the temperature would never go above 10 degrees Celsius and could come down to minus 30 degrees. Most of the time it was either snowing or raining and “dry” days were a few. Lightning strikes were rampant and we were advised not to carry anything metallic on us resulting in us never wearing our metallic articles of the uniforms. The terrain was treacherous, with narrow winding roads moving up the mountains. Driving on these roads was very risky, especially on snowy and foggy days. We all lived without our families and officers would get together in the evenings at the Officers’ Mess for dinner. Most winter evenings we used to be visited by our friends – a family of bears – father, the mother and three cubs in tow. They exactly knew where the store room of the mess was and the Mess Havildar (Sergeant) would throw a bag of atta (wheat flour) at them when they came calling on. These bears would carry this bag of atta and disappear into the shrubs and would come over few days later when this stock finished. These bears came as a gift to us being handed over to our regiment from the regiment we relieved. The Indian Army is very concerned about the “Wild Life” and about the role required to be played to ensure conservation. Colonel PK Ramachandran (now a retired Major General), our Commanding Officer, had passed strict orders that these bears were to be treated as “Guests of Honour” and were made as “comfortable” as we could. We all felt happy about our contribution in preserving the wild life and we felt happier that at least someone could live with his family at this altitude also. There was no reported instance of these bears ever attacking any army person in the garrison. They all appeared to be friendly and were very calm. Sometimes these bears would stand up and pose for photographs as if they could recognise a camera. We were all aware of the grizzly bears in North America attacking humans causing grievous injury, even death. We educated all our troops about the behaviours of the bears and the “Dos” and “Don’ts” were briefed to all by the Commanding Officer. Deforestation, poaching and human encroachment onto their living areas have forced these bears to move out of their natural habitats in search of food and water. During the winters in Sikkim, the upper reaches of the Great Himalayas are snow covered and these bears are forced to move to lower attitudes in search of food. In case they venture into human habitat they are sure to be chased away, hurt or sometimes even killed. Where else can they find a safe haven – with adequate protection, food and above all love in this inhospitable terrain – other than an Indian Army Camp! Our unit was located at Men-La.